Waiting Rooms – Where Opportunity Knocks! Pediatricians, veterinarians, ER staff– Your primary goal should be to minimize the time patients spend in your waiting room. But it is also essential to create a waiting area that reflects your dedication to patient care and customer service. Each detail affects patients’ impression of your practice. Here, experts weigh in on what makes a professional, practical, and pleasant waiting room, and provide some interesting statistics! Did you know? The average wait time for patients in an ER waiting room is more than 40 minutes! This is an opportunity for building credibility, reducing perceived wait time, and lifting sales – with dynamic signage. Increase customer satisfaction by improving the service experience. Strengthen the relationship between the customer and you – their service advisor. Educate the customer on the various maintenance services and parts replacements they need to receive to ensure vehicle performance and safety, and to save on overall vehicle costs. This leads to an increase in the sales of products and services you offer. Unlike television, radio or the Internet, full-motion ads enjoy the benefit of a built-in audience that’s guaranteed to pay attention whenever they’re broadcast,” explains Young. “There’s no “distractions” in a waiting room. Once they sit down, patrons have little choice but to watch whatever comes on screen. That’s an important consideration for business owners facing an increasingly fractured media universe. Surveys suggest that full-motion ads generate higher recall than TV and radio. One done in 2000 for Cineplex Odeon by Thompson Lightstone and Co. ofTorontolooked at “total recall” (the ability to remember an ad, with or without memory clues) among 323 patrons of film, TV and radio inToronto,VancouverandCalgary. Full-motion movie ads enjoyed a 74% average recall rate (the combined total for aided plus unaided recall). This was compared with figures of 37% for radio and 32% for television, according to research by the ComQUEST division of BBM Bureau of Measurement inToronto. Did you know? Independent programming (i.e. not created by the business itself) is viewed as 2-3 times more credible by the viewer – your customers. Greater credibility leads to greater response from the viewer. This is why programming in similar environments increases sales 18-62%. 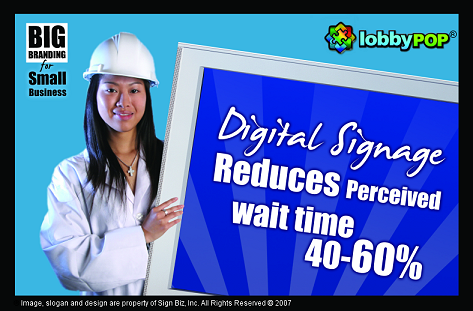 LobbyPOP Pros have these and more statistics at their fingertips, in a National Video Sign Statistics guide.